Geckos are great lizards for insect control. There are at least three species in Texas. Asian geckos are smooth-skinned and about 4 to 5 inches long at maturity. 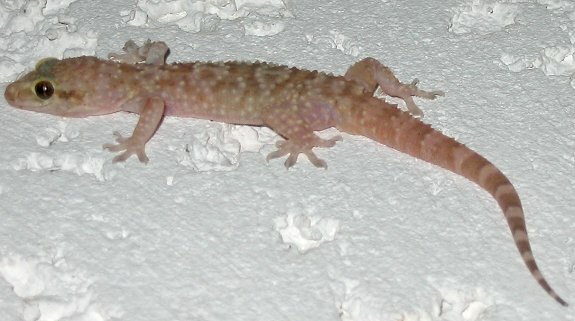 The Mediterranean gecko is the same size but has bumps and a ringed tail. The Mediterraneans can be bought at pet and feed stores. They should be protected and released as an important part of your organic pest control program. Both love to eat young roaches, grasshoppers, katydids, ants, and other insects. They are pale and translucent and have large lidless eyes. Their toes have broad pads and claws extending beyond the pads. 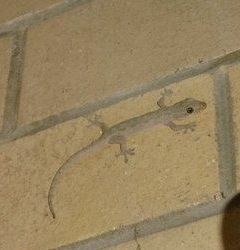 The Mediterranean gecko was introduced to Texas several years ago and has now naturalized across at least half the state. This is the most commonly seen gecko because it likes to live around lighted buildings so it can eat the insects that are attracted to the light. Breeding takes place for four or five months in the spring. They lay one to two eggs under shutters or even in the bases of light fixtures. The third species is the tokay gecko, also an Asian import. It is much larger and much more aggressive; although naturalized in some parts of Texas, we do not recommend its release. Unlike the small geckos, it can give you a painful bite. It feeds on insects but also eats small geckos and other animals. A gecko's eyesight is comparable to a cat's, geckos can see better than any other lizard. The gecko family includes more than 700 species-20% of the world's living lizards. Geckos are the only lizards that have a voice. Some species of geckos make a squeaking or clicking noise that sounds like "gecko," hence their name. Anatomy: Geckos have short, wide, fleshy toes with large, backward-curved claws. Most geckos have sticky toe pads, composed of microscopic Velcro-like hooked bristles (called setae) on the bottom of the feet; the bristles allow them to climb well, even on smooth surfaces or upside down. Diet: Geckos are carnivores (meat-eaters). They eat mostly insects (like crickets, springtails, and cockroaches) and mealworms. Predators: Snakes are geckos' main predators. When a gecko is caught by its tail, it releases the tail, which twitches for a while, allowing the gecko to escape capture. The gecko will later grow another tail.